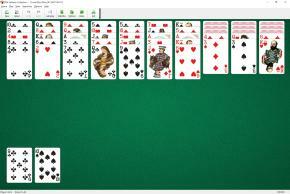 Three Blind Mice Solitaire uses one deck (52 cards). You have 10 tableau piles. Three rows of 10 cards are dealt - the first 7 cards face up and the last 3 face down in each row. Then two more rows of 10 cards are dealt, all face up. The remaining 2 cards are dealt separately facing up as a reserve. To build four sequences down in suit within the tableau, each running from King to Ace. You may build tableau piles down in suit. Groups of cards can be moved regardless of any sequence. Any face up card in a tableau can be moved to make a build. All the cards covering it are moved together as a unit. If, during play, any closed cards become the top card of a pile it turns face up. Empty tableaus may be filled with a King or group of cards headed by a King. You can move cards from the reserve piles to the tableau whenever necessary. Empty reserve piles cannot be filled.